One of the most important things you must know is your current asset allocation. If you don’t know what it is, the first thing you need to do is to figure it out. Here is a question I get asked often – how much should I have in stocks and how much should I have in bonds in my retirement account? The most important aspect of asset allocation is managing portfolio risk. #1 Governed by your age – the younger you are, the more risk you could take. This is because your savings is less and you have a long career ahead of you to earn, invest, and dollar cost average. #2 Self Learned from Life Experiences – you will experience investment losses in some way, shape or form as you go through life. You will learn from it and also learn about your appetite for risk from it. There are plenty of questionnaires out there that you can answer that will provide an assessment of your appetite for risk. It is a good starting point. However, somethings are best learned from experience and nothing can beat that. Let us say you are 30 years old and are going to live up to a 100 years. A good rule of thumb to follow would be to match your bond investment allocation to your age. Since you are 30 years old, you would allocate 30% in bonds and 70% in stocks. Now that you have the allocation figured out, let us figure out how you can go about investing in stocks and bonds. I am going to show you an absolute lazy man’s approach using three Vanguard ETFs that are passively managed. Below is a lazy man’s portfolio that follows the asset allocation rule of thumb using three low cost passively managed ETFs from Vanguard. VT – Vanguard Total World Stock ETF (Expense Ratio – 0.17%) – invests in U.S. and global stocks. 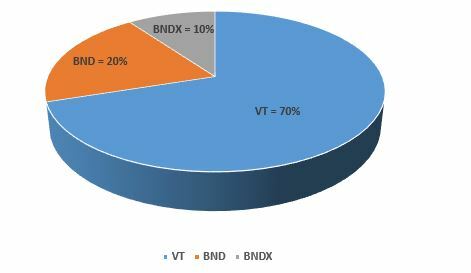 BND – Vanguard Total Bond Market ETF (Expense Ratio – 0.07%) – invests in U.S. based investment grade bonds. BNDX – Vanguard Total International Bond ETF (Expense Ratio – 0.19%) – invests in investment grade bonds outside the U.S.
With these three ETFs, you can cover the total world stocks and bonds. If you are too conservative (overly invested in bonds), then it will not grow significantly, and hence you will retire poor. If you are too aggressive and overly invested in stocks, then a market crash could hurt your portfolio so bad, that you will end up retiring poor. Finally, remember, risk vs. reward is the trade off here. A balanced approach must be taken so that you have enough money saved to retire comfortably. This simple portfolio that has an expense ratio of less than 0.25% will beat any actively managed portfolio run by any investment firm which would most likely charge you 1%-2% in fees. I will be covering this topic on a separate post. Using your age as a rule of thumb to determine how much bonds you have in your portfolio is a great way to get started with asset allocation. As you gain experience and understanding of your appetite for risk over time, you can become more aggressive or conservative on your asset allocation. Here is an excellent resource for your further reading: The Investor’s Manifesto: Preparing for Prosperity, Armageddon, and Everything in Between – Wall Street Journal Best Seller. Do you have any thoughts / feedback on asset allocation? Please leave a comment.